Spotted in Shepherds Bush, West London (there seems to be no applicable region in the available options?) Link this report to the 3 pictures "Segestria Florentina One", "Segestria Florentina Two" and "Segestria Florentina Three" in the pictures for this species, as these 3 images are all the large female. Living in the wall of the neighbours house, and first spotted about a month or two ago. She seems to be breeding, as there are now at least a dozen of them all in different holes in the wall. She is extremely aggressive, and does not like white light - only appearing in the night time. Added by Neil Wilkes at 20:05 on Sat 17th Mar 2012. WEST LONDON sighting, January - March 2012 We first saw this about 2 months ago (January 2012) where the front legs are plainly visible, as are the trademark green fangs. I had no idea what it was, but got a positive identification after submitting the 3 shots I cannot upload here to "Wild About Britain" website, where it was ID'd positively. It is indeed very, very aggressive. It only ever shows at night & seems to dislike bright light. The photographer tweaked the trip lines (accidentally) and it flew at him, with him only just getting out of the way in time. I have full camera raw images that are very detailed, as well as size reduced JPEG images and TIFF images if anybody would like them. They are not great, as it was very difficult to photograph at all - it never comes all the way out of the hole in the wall (north facing) and appears to be guarding the entrance at night time. One image shows the legs in clear detail, another shows the green fangs in detail. Fascinating creature. Added by Neil Wilkes at 11:12 on Mon 12th Mar 2012. The only previous Essex records of the large and impressive 6-eyed spider Segestria florentina (Rossi, 1790) are a female found on the wall of a bedroom in Southend-on- Sea (Payne 1994), and a large female in November 2002 at Leigh-on-Sea in a box containing a toy that had been sent by mail order from West London (R. G. Payne, pers. comm.). Now Fred Stevens has identified a flourishing colony of S. florentina at Tiptree in Essex (TL892159). The original Tiptree spider, or its cast 'skin', was found in the garden of Fred's sister by his 6-year-old niece, Tara, who thought it looked 'different' from the usual garden spiders. Fred searched on the web and identified it as Segestria florentina. He sent me photographs showing the characteristic green iridescent jaws of adult S. florentina and I was able to confirm his identification. Fred looked where his niece found the original spider and discovered the characteristic webs high on the wall. During the daytime the webs' owners were too shy to show more than the tip of a couple of black legs, but at night at least six live S. florentina were confirmed. Bristowe (1958) describes the web of Segestria with its characteristic long straight 'fishing lines' radiating from the tubular entrance, quite unlike the matted silk of the common Amaurobius similis frequently to be seen on walls and fences in houses and gardens. Brushing one of the fishing lines very gently with a fine tip of grass should get the owner to dart out of her tube with the speed of lightning, biting fiercely and then once more backing into her tubeâ€”all in the space of about two seconds. Of three British Segestria species, only the smallest, S. senoculata, is at all widespread, and S. florentina is scarce with scattered records in southern England. 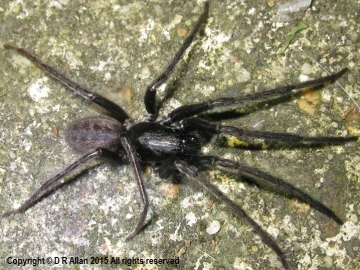 When Bristowe wrote The World of Spiders the spider was only known to be established in a few southern towns near to the sea, but it has increasingly been found inland as far north as Oxford, and it seems to be increasing in numbers and distribution. Bristowe, W.S. (1958) The World of Spiders. Collins, London. Payne, R. G. (1994) Two large foreign spiders in Southend. Essex Field Club Newsletter, 12: 7. Added by John Partridge at 16:09 on Wed 4th Jan 2012. Records of the gradual spread of Segestria florentina (Rossi, 1790) have interested me since 1968 when I first started working with the late Doug Clark, who advised me to visit Dean's Yard in Westminster to find this species. I quickly developed a useful technique for catching them, even though I half frightened to death a group of inquisitive American tourists: 'What IS he doing?' The sudden emergence of the spider made even my heart skip a beat; the tourists covered about 100 yards in 10 seconds! My technique is to use one of those small slightly curveended spatulas from Tiranti, inserting it very carefully along the edge of the tube web. This usually panics the spider into full retreat, despite the care being taken. Once the spatula can go no further, I leave it with the spider for around 5-10 minutes to let it 'regain its confidence' and then use the curved end of the spatula to cut off its retreat and begin to push the spider gently forwards. This has a variety of reactions from the spider. Normally, it will emerge and run over the wall desperately seeking another bolt hole, so you have to be quick with your catch tube or (large-size) pooter. On one occasion I was asked by an anxious mother in Romsey (Hants) to remove as many of the 'nasty spiders' from her garden wall as possible so that her little son wouldn't get bitten. My technique proved to be working but, on one occasion, I was holding the catch tube about six inches from the wall with one hand and 'coaxing' the spider out with the other. Suddenly the spider rushed forward and leapt into space: again my heart skipped but quickly recovered when I saw that the spider had obligingly jumped straight into the tube! It must have bunched its legs together against the fall and fallen neatly inside. The 25 evicted spiders were liberated on my workplace buildings where we already have a small colony. I have tried the tuning fork method but S. florentina, as endorsed by Messrs Penney & Drew in Newsletter 76, are very wary and will only 'show a leg' if this prey-simulation technique is used. I will try out the 'ant-sprinkling' technique next time! Added by John Partridge at 16:02 on Wed 4th Jan 2012. The first of these occurred in Brittany about three years ago. While examing the walls of old farmhouses my wife drew my attention to some large tube web retreats characteristic of Segestria sp. Having been shown by the late D.J. Clark how to catch Segestria, or at least to make her appear, I started to brush the largest of the 'trip wires'. Almost at once the characteristic bunch of legs protruded from the hole and a very large Segestria florentina, (Rossi) rushed out, bit the base of my brush and at once retreated. Due to her large size I decided to capture her and keep her alive for observation. On looking down her tube I could see she was not far in, the cold reflection from her eyes being easily visible, so I found a slender twig and pushed it inside the hole, on the outside of her web. At once she retreated to the depth of her tube and I pushed the twig to its full extent giving it a twist to wrap the end of her web in a knot. It worked and before I had time to move the twig again, she rushed out so furiously that she fell at once to the ground. We instinctively jumped back somewhat startled, but the spider being far from hurt by her free fall raised her front legs and attacked anything that came near. I could hear the rasp of her fangs against the glass tube that I was trying to put over her. Finally after an exhausting two minutes, by which time she was about five yards from where she fell, I managed to catch her in the tube. Even then she did not give up and by the time I put her in her new home, she had chewed nearly half of the cork stopper to shreds. Since then she has successfully borne two large families. I only see her momentarily when she seizes the mealworms I give her, and watching her do this reminds me of her ferocity with a pair of bottle green chelicerae flashing angrily in the sunlight.. Perhaps this is our most aggressive spider?